Growing up eating the Standard American Diet of meat, dairy and sugar was probably at least a little better than the way kids eat today what with all the chemicalized and fake foods, although I did my best to go to the farthest extremes possible such as the Saturday morning ritual of eating as many Aunt Jemima pancakes with not-real-maple syrup as my little tummy (which was getting to be a big tummy) could hold. Never got past eight. I loved cooking from a young age and I have always described my foray into cooking as being the first meal I ever made at the tender age of ten when I cooked my Daddy a lovely meatloaf with instant mashed potatoes and frozen peas. But that isn’t when I started “cooking.” Much earlier, I would climb up on a kitchen chair to reach the top of the refrigerator where the Arnold’s Bakery bread was kept and I would pull that down and make myself numerous butter and sugar sandwiches and stuff them down. At night while my parents were asleep. Meanwhile my Daddy was worried about how chubby I was getting but I was not the least concerned. He would make sure I got plenty of good, solid protein in the form of charcoal-grilled steaks and baloney sandwiches while Mom made sure I got plenty of vegetables in the form of canned green beans and frozen vegetable medley. She was fascinated by food inventions and food trends one of which was the “cannibal sandwich.” Sorry to have to tell you this, but it was raw ground beef with a lot of raw onions and hot mustard on deli rye bread. I loved it. Somehow I made it through my teen years without becoming a poster child for obesity though I was big enough that I felt more comfortable making my own clothing instead of shopping. I made all my important clothes such as prom dresses. I had plenty of friends and boyfriends and even though I did wish I could be thinner, there was something that seemed to make up for it all. I was voluptuous. I continued on through college during which I ate like a lumber jack (interspersed with crash dieting) and continued my culinary experimentation every weekend making the most incredible foods I could imagine and after college, when I started making money, I indulged in finding the highest quality ingredients available. Back then “highest quality” meant going to a little local butcher shop and buying their most expensive item which was milk-fed veal to make veal piccante. By this time I was also old enough to drink alcohol which amazingly I had never tried until I was actually of legal age—21—but if I thought cooking was an infinite adventure, let me tell you there is a whole world of cocktail making that I discovered, especially the mixed, blended, creamy, sweet ones, but also the aged, imported and specially brewed liquors and beers. And there was cheap, sweet Scuppernong wine. Interesting yes, but not an endless adventure for me. I lost my interest in mixology and alcohol. It was just a short-term digression. Then one day I was sauteeing my milk-fed veal and thought, “I’m not too happy and I think my life would be better if I changed how I ate.” Honest-to-god I hadn’t read anything, heard anything on TV and I didn’t know anybody who was into health food. I just had the thought and once I had that consideration—that I might feel happier if I changed my food—I took a complete 180. I have written about this before. When I say I took a complete 180, I probably should say I moved to another planet as far as food was concerned because I found my way into a macrobiotic study house where I lived with other students of macrobiotics and the teachers who owned the house provided 100% fabulous meals made with whole grains, beans, vegetables, and fruits that were all organic, whole and had not one milligram of chemicals or sugar. If you lived there, you didn’t just wander into the kitchen in the middle of the night and make yourself something. You ate what they served and it was an honor to be allowed or even invited to help cook—which I eventually was invited and from there helped teach the cooking classes and became a cooking teacher in my own right for the next 25 years or so. What’s macrobiotics? The word, coined by Georges Ohsawa, literally means Great Life. As a food philosophy, it could be said that one lives a greater or fuller life by looking at the whole picture to achieve balance and health. Whole foods are a big part of this and how to achieve the right balance is a big part of this. For much more information, look here. This is where I really got my balance back or more accurately, got it for the first time. I knew how to choose and prepare foods to create the effect I desired within myself and for my family. I was also exposed to a spiritual philosophy that was my first entrance into understanding my own spirituality. This is another major layer of digression. From these beginnings, I realized I was looking for answers to the “big questions of life” and I kept looking until I found them in my current religious practice. By the time I met my Hubbin’, I had been 100% macrobiotic for thirty years. He was a meat ‘n potatoes guy but he had earlier dated someone who was macrobiotic and he was familiar with the food and liked it quite a bit. I’ll never forget the first meal I made for him hoping that he would not be turned off and we would have future dates! I made a deep-fried tofu stew with brown rice and some vegetable side dishes and some kind of dessert. Pie, I believe. He did like it! We continued eating grains and beans and veggies at home and he would get his “fix” of meats and other things whenever he ate in a restaurant. Which was mostly all the time since Hubbin’ didn’t cook or even heat up leftovers. A bachelor for many years before me—cooking and reheating just weren’t domestic activities he’d pursued. But God Bless ‘im! At home he continued to love whatever I made and he bravely tried all kinds of things that he’d never eaten before. One of his favorite things was (and still is) freshly cooked brown rice with chopped roasted almonds on top. We were hummin’ along just fine until I had to go to Los Angeles for training for my job and my meals were included in the program. The food served was one specific menu for each meal and most all of it was excellent in quality, and included lots of fresh vegetables, but it was by no means what I was used to. At first I tried to compromise as little as possible and eat what I could, but I was there for four very busy months and I got hungry! So I ate whatever was served. Needless to say, that was quite a regression for me. When I returned home I was still craving meat and dairy food and even though I continued making brown rice and vegetables, I was also making the other stuff. My kids just about died of shock when they heard I’d come home and served Swedish Meatballs for dinner. As time passed the organic version of the Standard American Diet reared its ugly head more often and whole grains were no longer the stars of the show. Both my husband and I were very busy with work and activities and it became more and more convenient to buy food out somewhere much of the time. This cannot be done on a regular basis and still eat very well unless you have a boatload of organic, health-conscious restaurants around which we did not. And even if we did have those—such as the deli and prepared food sections of large “healthy” grocery stores, you are at the mercy of “what sells.” And “what sells” in today’s health food store is largely not what I would characterize as “very healthy food.” And that subject, my friends, is another major digression I shall not take up here. Hubbin’ had several moderately alarming health issues. I got fat. But I could also see the decline of my own health which I conveniently chalked up to “aging” until I was willing to confront what really happened. I lost 25 pounds on my own and then I digressed (again) into a very personalized, specifically prescribed dietary program and lost another 70 pounds. To be sure, there were lots of benefits to doing this program. Then Hubbin’ did it too and I did it some more. It was like a little respite from having to make any decisions at all about food. We just ate what we were supposed to and lost weight. Does this sound appealing to you? Are you enticed by the idea of a workable weight loss program that uses only real food and no pills or potions? I understand. I was too. I had digressed so very far from “balance.” And you may be tempted to ask what the program was and where can you find out especially when I tell you that it did entail some very well-researched data on how to naturally balance hormones with just food. What I got out of it was that I was again eating a lot of fresh vegetables daily–more than I had for some time. And I learned exactly what types of foods will cause me to gain weight. All of that was useful not to mention that I did lose weight and so did Hubbin’. But the program had no grains in it except for a few certain types of crackers. All the carbohydrates came from vegetables and fruits and the rest of the menu was low-fat dairy, meat, fish and poultry. This is not a sustainable way to eat long-term. No it isn’t. I began noticing some health deficits that I didn’t like. The day I finished the program and began eating a tiny amount of whole grains or bread, the bad symptoms went away. The day I went back on the program to do it with my husband the bad symptoms came back. I knew I was not going to go down this road any further. So once again, I digressed. And what do you know? I knew what to do exactly. I knew what type of “vegetarian or vegan” food would cause me to gain weight and have problems and I knew what it was about the no-carb meaty program that helped me to lose weight. (It wasn’t the meat and it wasn’t the “no grains”. And I knew that I could easily return to whole, plant-based foods and get it right and have it fit into my busy life and regain all the benefits and lose all the deficits. I knew I could cook my little heart out and keep on creating amazing food that I enjoy more than any restaurant and that Hubbin’ will also love and benefit from. I also don’t have to worry about how much food I am eating. I find I have returned to “balance” very quickly despite the long and winding digressions. The transformation, particularly in how I feel every day, is nothing short of spectacular. And all that cooking each step of the way no matter what I was making is all part of the package that I call my “expertise.” Today I do not consider I have problems related to aging. Today I am grateful for every food experience I ever had because all of it contributed to the know-how I have acquired. If you actually read the whole thing, I hope it was worth it. I’ve been wanting to write it for some time. And the funny thing is, as much as I love cooking and love eating and love sharing what I know about these subjects, my life is not all about food. Not in the least. I would describe it this way: I am happily and creatively complying with the fact that I have a body which requires certain things to remain healthy and alive. And having the know-how about this frees me up for the much broader, wide-reaching endeavors that I pursue. Choosing healthy food and good nutrition is very therapeutic, but it is not the main event of living life. Cooking for me is a creative outlet more than anything else. Understanding what can be created—now there’s a fruitful digression! It was a long story! That’s what can happen when one digresses. And no pictures, either. So here’s one for you. Thanks for listening! This entry was posted in Cooking, Health, Lifestyle and tagged carbohydrates, digression, George Ohsawa, health food, improving diet, macrobiotic, vegan, Whole foods by mycookinglifebypatty. Bookmark the permalink. Such a great post! So informative & encouraging. But I couldn’t find the like function. Please know I liked! Thank you, Cindy, for taking the time to read it! This is really inspirational. I didn’t know you lived in a macrobiotic house with actual macrobiotic other people! How cool is that? I remember how good we felt–and how much weight we lost–when we did that 100% macro diet back maybe 7-8 years ago. Now we’re kinda in-betweeners. Some times I long to go back eating that clean again…but have become (sigh) kinda addicted to my occasional glasses of wine and daily cup of coffee. You have me thinking, Ms. Patty. Hi Kathy! I wasn’t sure I should post this long, self-centered story at all and yet I did. Mostly for me. I’m glad it is also inspiring. Yup the macro study house was very cool and I made great friendships there. I even had my own house at one point with people living there and eating my cooking, etc. It was in the late 70’s that the macrobiotic diet became focused heavily on cancer. Many people sought the diet out in order to cure degenerative illnesses – especially cancer – for which they had to eat very, very strictly. I myself stuck to the principles of macrobiotics and applied them to a wide, non-cancer-curing drastic kind of menu. I remember my teacher at the study house drank coffee every day and we enjoyed sake and beer on special occasions. For myself and my family I find that a wide and varied menu is best–following the principles for balance closely, yes–but not following what I would call a “cancer diet.” Does that help? I read the whole thing. 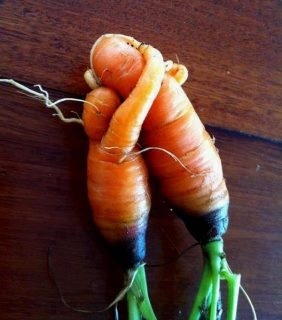 I LOVE that photo of the carrots hugging. How cute is that? So, I am feeling very inspired by you to make cooking a creative outlet. Because I hate cooking I’m looking for a reason to like it. I love your posts about the health of food, especially about how much better you feel when you eat a certain way. I find I have more energy when I eat less food, even when it’s not especially healthy. I buy all organic whenever I can and subscribe to a farm where they deliver organic produce once per month. So, I’m with you 100%. The spa I sometimes go to (Murad) has on the wall: “Before there was medicine, there was food.” I love that. Hello Janine and Happy Mothers Day! Great quote on the spa wall. Wonder who said that — maybe Hippocrates? You make a good point about feeling more energetic when you eat less. Me too! I’m going to think about tips I can write that would help you to enjoy your cooking a bit more and get into the creative side of it. Thanks for your heartfelt comments. It’s rewarding to really start a conversation and get a real response!